Open in Aperture 2, crop, white balance adjustment, enhance by increasing contrast and definition, levels, reduce highlights, saturate yellow a little. While I did saturate the yellow a bit, mostly it was already there; it was created by the effect of the tall, dead grass between me and the zebras as I moved parallel to the zebras in a truck, causing a blurring yellow effect. Hi Sean. 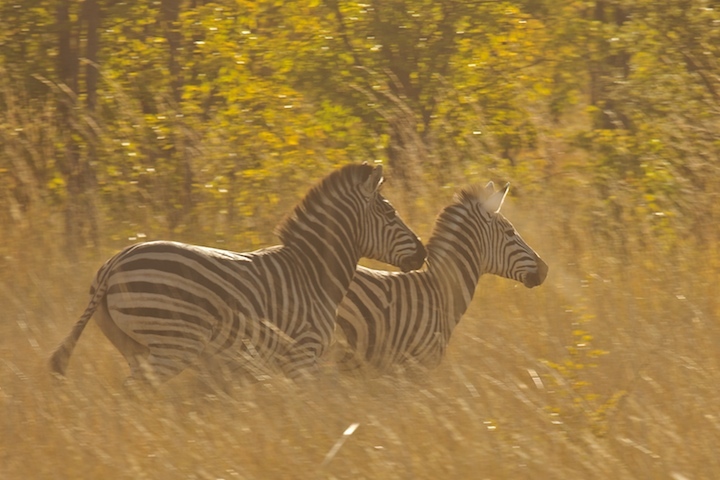 This is a typical shot of them running from danger, ears up and both looking at the source of danger or the lead Zebra. In the African dry season as you know when you took this shot (Winter months June July August or so) theres no rain and it's dusty largely from the heard stirring it up. Commercial photography of Zebra's tries to avoid this to make them "pop" out as Juliette mentioned. How utterly amazing to be able to see these magnificent animals in the wild, let alone take a shot of them. Gorgeous. This really is an amazing shot, but as you know the clarity is not there. There is a lot of dust in the air, probably from the truck you where in. There are several ways to remedy this problem in post processing. Once you have the clarity cleaned up, some dodge and burn on their stripes would make them pop right out. Gosh! I am surprised how poorly this did. I really like this shot! Proudly hosted by Sargasso Networks. Current Server Time: 04/24/2019 09:54:45 PM EDT.